The Memorial Candle Program has been designed to help offset the costs associated with the hosting this Tribute Website in perpetuity. Through the lighting of a memorial candle, your thoughtful gesture will be recorded in the Book of Memories and the proceeds will go directly towards helping ensure that the family and friends of Holly Novak can continue to memorialize, re-visit, interact with each other and enhance this tribute for future generations. Holly Sieders-Novak, 18, a resident of Virginia passed away on Friday August 7, 2015 in Greenville, Texas from injuries sustained in an automobile accident. She was born on September 19, 1996 in Fairfax, Virginia a daughter to Jeffrey Novak and Laura Sieders. She graduated from Herndon High School in 2014. She was proud to have been a drum major for The Pride of Herndon Band and with the band marched in the Pearl Harbor Memorial Parade on December 7, 2013. She also served as co-captain of the band’s Relay for Life team. She currently was attending college to pursue a degree in psychology to assist her in her lifelong goal of being a dolphin trainer. Holly loved her time spent in the U.P. with her family and was looking forward to being a full time “Yooper”. She also loved everything Disney. Everyone she came in contact with loved Holly, and she packed a lot of life into her 18 short years. Services will be held on Saturday August 15, 2015 at 2:00 PM in the Erickson Crowley Peterson Funeral Home in Calumet with Minister Cathy Collins to officiate. Visitation will be on Saturday from 11:00 AM until 2:00 PM in the funeral home. Please dress casual because in Holly's honor. 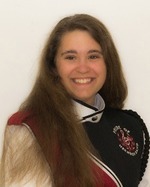 Anyone wishing to make a contribution in Holly's memory please send donations to: Herndon Band Relief Fund at Trinity Presbyterian Church, 651 Dranesville Road, Herndon, VA 20170. To send flowers to the family of Holly Jayne Novak, please visit our Heartfelt Sympathies Store.